This cartoon ran in the Milwaukee Journal on Sunday, April 7, 1912. This photo collage by the Journal's own reporter/photographer "Brownie" depicts new manager Hugh Duffy as he was beginning his new job as Brewers skipper. "Sir Hugh" Duffy might have been new at Athletic Park, but he was well-known to baseball fans in the Cream City. Duffy was the player/manager of the 1901 Milwaukee Brewers, playing in what we now recognize as the inaugural season of the American League. When those Brewers moved to St. Louis following the season, he stayed behind to manage the Milwaukee Creams, one of the two minor league clubs which sprang up to take their place. The Creams folded (or more precisely, the Western League folded around them) partway through the 1903 season, and Duffy found himself back in the bigs for 1904, this time with the Philadelphia Philles. He stayed in Philly for three seasons, then spent the next three with the Providence Grays (all but the last as player/manager) before moving to the White Sox in 1910. He managed on Chicago's South Side for two seasons before returning to Milwaukee at the beginning of 1912. Duffy had reportedly kept a good relationship with Brewers owner Charles Havenor, despite being on opposite sides of the city's baseball war in 1902-1903, and when Brewer skipper Jimmy Barrett quit after a single season, Havenor lured him away from the White Sox and back to Milwaukee. The Journal proclaimed Duffy brought with him "the confidence of the Milwaukee fans" after Barrett's lone campaign. Unfortunately, Duffy's second stint in Milwaukee was as brief at the first. 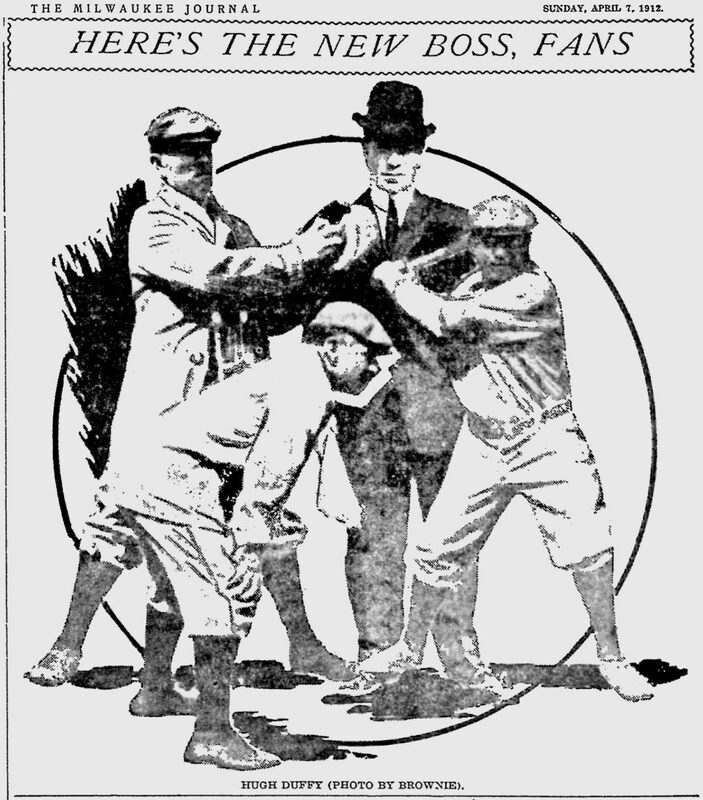 1912 was a deeply disappointing season on the diamond and a turbulent one off it; Havenor died right before Opening Day, and in the midst of the inevitable chaos his widow tried to gut Duffy's salary. Sir Hugh's response was to resign the job rather than wait to be fired, and the Brews found themselves looking for their fourth manager in as many seasons.